I must confess: I am twitter challenged. I have maintained a blog – off and on – for the past six years and feel comfortable connecting with cyber-friends in this venue. I understand FaceBook and probably spend too much time connecting with others via this medium. But Twitter is a bit over my head. There are so many people to follow – so many hashtags to consider – too many conversations happening simultaneously for this one-track mind to keep up. But recently I challenged myself to take part in a Twitter conversation hosted by Joy Weese Moll. We discussed our New Year’s Resolutions regarding creativity – and encouraged one another to stay the course. Participants were few (the Super Bowl seemed to take precedent) but I did enjoy chatting again with Janel, and meeting Create with Joy, who encouraged me to take part in her weekly meme: Inspire Me Monday. Since I love all things creative (rubber stamping, scrapbooking, photography, art museums, etc) I thought this would be the perfect meme for me. So today I will dip my toe in the water. Since several of you expressed interest in my upcoming trip to Europe, I thought I would countdown these next four weeks (we leave March 15th) with some anticipatory photos. 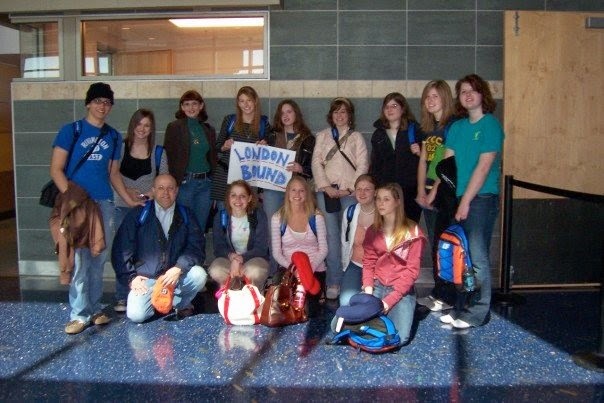 The first time I led a group of students overseas was in 2007. There were thirteen students and two chaperons (myself and my husband) and we stayed in London for six days. I booked the trip through EF Tours, and I cannot praise this company enough! They have been in the business of introducing students to worldwide travel for fifty years – and they do it right! Since I taught Brit Lit, I wanted to focus our attention on British authors and their surroundings. 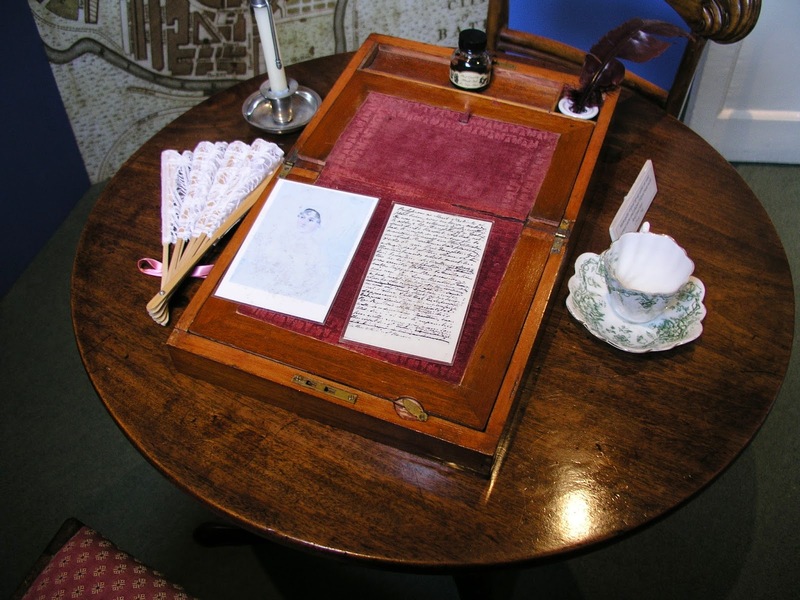 We were fortunate enough to visit Bath … where the Jane Austen Centre gave us insight into the author’s life as well as served us a delicious “high tea” There was simply not enough time to immerse ourselves in the culture of the Regency Time Period. 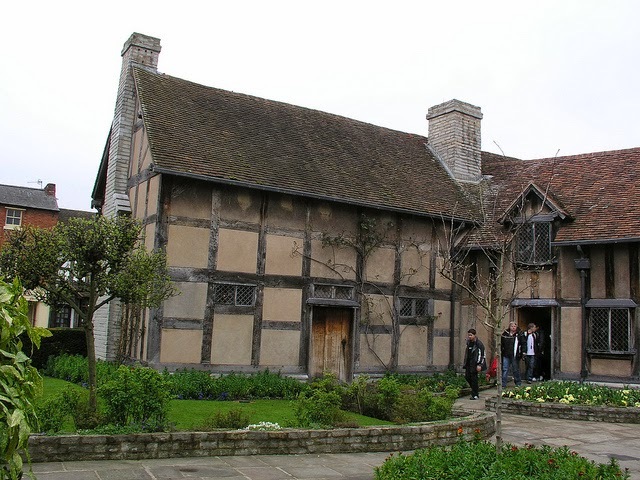 We also took time to travel to Stratford-upon-Avon, birthplace of the Bard himself, William Shakespeare. I absolutely adored taking the tour of his childhood home, and enjoyed walking the cobblestone streets of the town even more. I am now inspired to schedule a return trip to this area, which is part of the Cotswold’s. I hope to one day stroll along the pathways, traverse through the backyards, and stay overnight in the small villages that comprise this picturesque English countryside. We were also lucky enough to take an hour’s time to visit Oxford. While I may be too old to realize my dream of studying at one of the 36 colleges of Oxford University, I still adored the academic environment of the village. 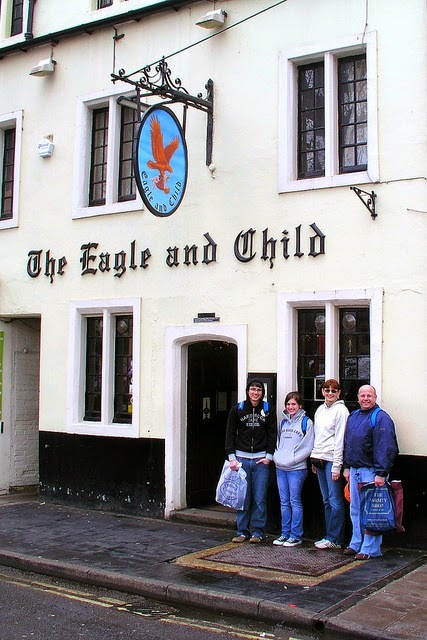 To think that C. S. Lewis and J. R. R. Tolkien walked these same streets is mind-boggling – and to visit The Eagle and Child pub where the Inklings would meet each week to discuss their current Works in Progress was reverential. My favorite British author is the incomparable Charles Dickens, but alas, the museum was closed the last time I visited London. I am hoping to add that literary stop on this upcoming trip. Next week I plan to showcase some of the iconic London sites, and the following two weeks will focus on my visits to Paris. Yes, I don't tweet either. I think I have a one-track mind as well. Lovely pictures and will enjoy your countdown. That sounds like such fun! I have never been to Europe, but hope to sometime. Whenever I think about taking that kind of trip, I always wonder how in the world people decide where to stay! I mean, I know there are always travel agencies with suggestions, but I would much rather find out from friends, so I look forward to hearing about your trip! Are there any particular websites you visit, for suggestions on where to stay and what to do,with ratings by individuals? Thanks! By the way, I am very inspired by your determination to be your own person versus doing what everyone else thinks you ought to do. I am trying to work on that in my own life. Meleah — I'm so excited you are interested in hearing more about my travels, as I hope to do more traveling (and writing) in the near future! Loved hearing about these adventures and seeing the photos. This would be a great post to link up to British Isles Friday, too, if it's still on your mind then. Joy — I LOVE this link! I'm hashtag/twitter challenged as well. I don't get it. So, did you choose a course to take at Oxford? If I were going to take a class this summer, it would be The Eighteenth-Century Country House, which is full so it's a good thing I can't do it anyway! There might still be spaces in Wordsworth's 'The Prelude'. Imagine a whole week discussing one poem in Oxford. Bliss!